Adding a Fillet may enhance your picture framing project. A fillet is a small piece of moulding which fits typically, underneath or in between a mount , and is used for decorative purposes. Fillet can be pronounced in two ways. One way is to pronounce it as if it were “fill-it”, as the similar term from mechanical engineering is pronounced. The other is similar to the French-derived culinary term. Either is acceptable in English, though most frame shops in our part of the world use the former. Fillets are typically made of soft or hard wood, and feature a flat “lip” which can fit underneath a mount opening ; the non-lip portion is what is displayed. Except for their shape and size (which is understandably small), they are constructed similarly to picture frames, usually from wood. Fillets are available in a number of styles and finishes, including gold and silver leaf finishes. The fillet is normally used as decoration in the mount of a picture frame… the intent is to help draw the eye inwards to the art or document being framed. Fillets can add a cohesive element, create visual space, or add some extra detail to a plain frame. When used it sits on top of the artwork, as opposed to providing a lip for the art to sit in, like a picture frame. Instead, the “rabbet” section of the fillet is above the lip, so the mat or picture frame can sit on top the fillet. 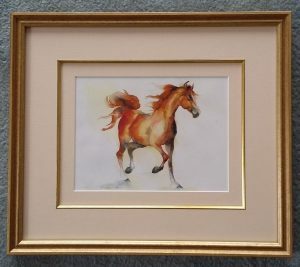 Here we use a gold leaf fillet on this framed print of the horse. In this case the fillet is fitted between the two layers of the double mountboard, which adds depth to the picture and draws your eye inwards to the image. It certainly enhances the overall appearance of this framing project. It is certainly worth considering for some framing projects. What is bigger, 4 or 7?